Conflict is at the heart of most comedy. But if everyone gets along, there’s not much to laugh at. One of the great joys of physical comedy is watching a fight unfold. Clowns are relatable because they wear their heart on their sleeve, much as a toddler might go from laughter, to shock, to tears, and back to laughter. What may start with one clown mistakenly taking the other’s suitcase can escalate into an all-out brawl. Clowns Without Borders shows come together very quickly, so we rely on easily accessible, common vocabulary. As a performer, I love slapstick. It’s a nearly universal clown language, and I have so much fun getting carried away in the absurdity of a clown fight. 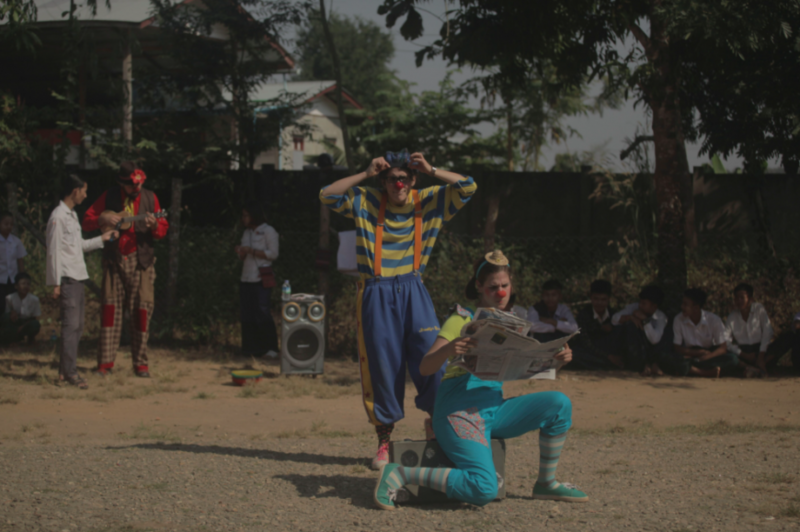 But when clowning in conflict zones, some of the familiar slapstick tropes lose their charm. For communities experiencing acute or generational violence, a punch is not a punchline—it’s an exhausting reality. I noticed this firsthand in Myanmar. CWB – USA toured in partnership with Mines Advisory Group, and part of the show contained safety messages about explosives. Our ideas for the show had to be approved, and also needed to uphold the educational messaging. We couldn’t add anything to the show that made mines look fun, or showed us playing with a mine. Nor could we add anything that made light of an explosion or injury. This meant that a lot of our initial ideas were cut. One was to pretend the diavalo was a mine and play a comedic game of “hot potato.” Of course, this meant the clowns would have to touch “a mine,” which went directly against the safety message. Ditto for the idea of a ball rolling into an unsafe area, and the clowns using acrobatics to get it back. Finally, after a lot of trial and a lot of error, we found a story that worked: The clowns are arriving in a new place and learning about what’s safe for that area. As we learned about the real-life consequences of living with land mine contamination, it felt considerably less fun to create violence or aggression in the show. In response, we shifted some of the slapstick moments. Instead of overt clown conflict, our conflict was accidental (mostly). This meant that when Andres took a bow, he would accidentally hit Leah and me. Instead of pulling Leah’s pants down, they would fall off “accidentally” as she jumped rope. We decided that it was more fun to be clumsy (very, very clumsy) than overtly violent. The most violent part of the show was when Leah stole my newspaper. This results in a tug of war, but Leah gets so carried away that she continues the tugging action after I stop. To get her attention, I tap her with the rolled up newspaper, which sends her into a dramatic fall. This leads to “Dead or Alive,” a skit wherein one clown (Leah) pretends to be dead, and the other (me) goes into hysterics. Why is it funny to watch one clown grieve her friend’s death, especially for an audience who shares this experience? Maybe because the outcome (death) doesn’t match the action (a tap from a newspaper). Or maybe because we know all along that this is a joke on me. As I sob, over Leah’s “dead” body, she sits up and makes fun of me. It reminds the audience that this is all a game. What Do We Want To Leave Behind? Previous Post: What Is Protracted Displacement? Next Post: Did CWB – USA Meet Its 2018 Goals?